Yes that is spelled "Abds" intentionally and we went cheesy with "'Add'ing". We are not speaking of your abdominal muscles here (later, in another article), but those two muscles groups, one each, which are found in the upper outer-thigh located near the glutes, more named for their support of outward motion (than by anatomical name) from the vertical hip plane - abductors. Their opposing inner-thigh muscles are the adductors. Both are equally important for balance, lateral movement, running and resisting injury and should be strengthened proportionately. Unfortunately, they usually aren't unless one has a well rounded fitness or resistance training routine. 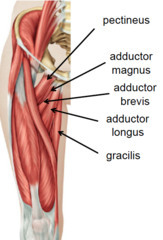 There are so many sports which require good adductor/abductor flexibility and strength whether it be tennis (major influence on quick lateral movement and recovery), golf, running, football, dancing, boxing or gymnastics. Beyond this, good adductor/abductor conditioning reduces the chance of injuries or ailments such as those found in the knees, groin and hips regardless of whether or not one is an athlete. There are several ways to condition your ads and abs (I can say that now without any confusion. ), whether it be via body resistance techniques, yoga, pilates or weight machines such as the one shown above. Speaking of such, I happened to have been in the gym business and catered to the broader membership, always mindful of the what took place in the facility and with our patrons. Some guys feel the adductor and abductor machines are "Ladies Only" equipment. So, if you happen to have a meat-head acquaintance pass by you and say, "That's for girls" (as if they just left grammar school), simply reply with, "You don't really compete in any sports, do you? An extremely large majority of them don't, so don't worry about it. If they were seriously trained and athletically educated in high school, college or pro sports, such a remark would never be made. Sorry. I had to make a point here - I appreciate hard-core athletes and even well-rounded body builders, but meat-heads are a whole 'nother breed. Check out Strengthening Your Hip Adductors.